A Pair of elegant club chairs by Paolo Buffa. In two tone coloured wood with the original recovered sprung seats and cushions in silver velvet. . .
Measure: 86cm high (backs) x 39cm high (seats) x 67cm wide x 69cm deep. . .
An elegant console table by Paolo Buffa, with ebonised tapering legs and tambour frieze. The central drawer with marquetry decoration. Brass fittings throughout and a beautiful fossil marble top in a putty colour. . . Measures: 110cm wide x 87cm high x 32cm deep. An #Italian #armchair in #cherrywood by #PaoloBuffa of fine quality. Newly #upholstered in white #Fermoie linen. A pair of #Italian #armchairs in #cherrywood by Paolo Buffa of fine quality. Newly #upholstered in #dark #grey #horsehair. A set of four elegant curved ladder back hall chairs by Paolo Buffa. Newly upholstered in scarlet velvet. . .
A pair of elegant curved ladder back hall chairs by Paolo Buffa. Newly upholstered in scarlet velvet. . .
A large ebonised Paolo Buffa credenza of Neo-Classical design, comprising for cupboards with shelves, birch lined. Each door having a brass ring & key with brass sabot detailing and feet. . .
A fine Italian rosewood writing table by Paolo Buffa. Of simple elegant design, on fine tapering legs with sculptural sabot feet, a glass inset top and single lockable drawer. . .
A large Italian Neo-Classical console table by Paolo Buffa. With a serpentine front encompassing four drawers and six tapering legs with brass sabot. The frieze is beautifully executed in marquetry and there is a shaped marble top. A set of six Italian Neo-Classical dining chairs by Paolo Buffa. Of elegant design and newly upholstered in emerald silk. . .
A fine Italian mahogany desk chair by Paolo Buffa. With a newly upholstered seat in grey wool. . .
An unusual console table by Borsani in rosewood with sculptural detail resembling ivory. With a central frieze drawer. An Italian Neo-Classical secretaire by Paolo Buffa. In rosewood with contrasting detail in veneers, brass fittings and an unusual key. The inside with compartments and drawers. A large and impressive Italian secretaire cabinet in the Neo-Classical manner by Paolo Buffa. 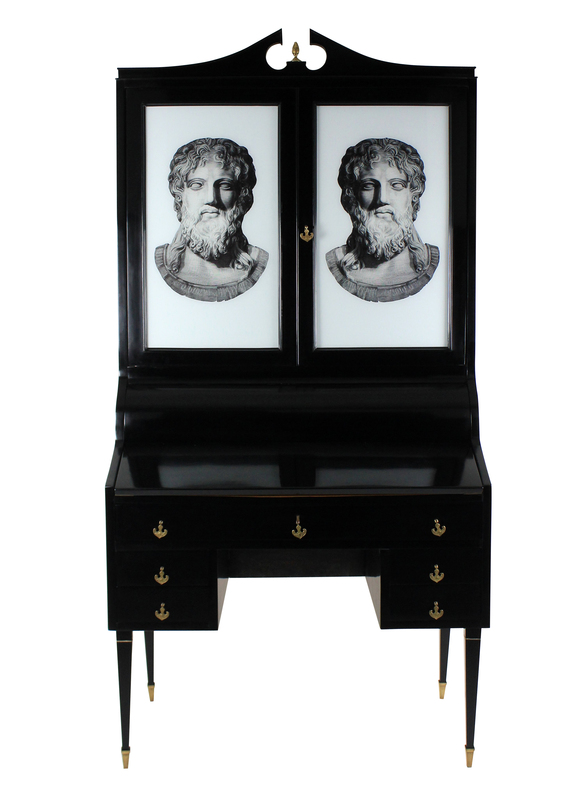 Ebonised with a lemon wood interior and hand painted glazed doors in the manner of Fornasetti depicting the God Zeus. . .
A set of six mahogany dining chairs of stylish design by Paolo Buffa, newly upholstered in duck egg fabric. . .
A settee / day bed by Paolo Buffa. In two tone coloured wood with the original recovered sprung seats and cushions. There is space for a blanket under the sprung base and one arm folds down to enable it to be used as a day bed. . .
En suite with a pair of club chairs and pair of foot stools. 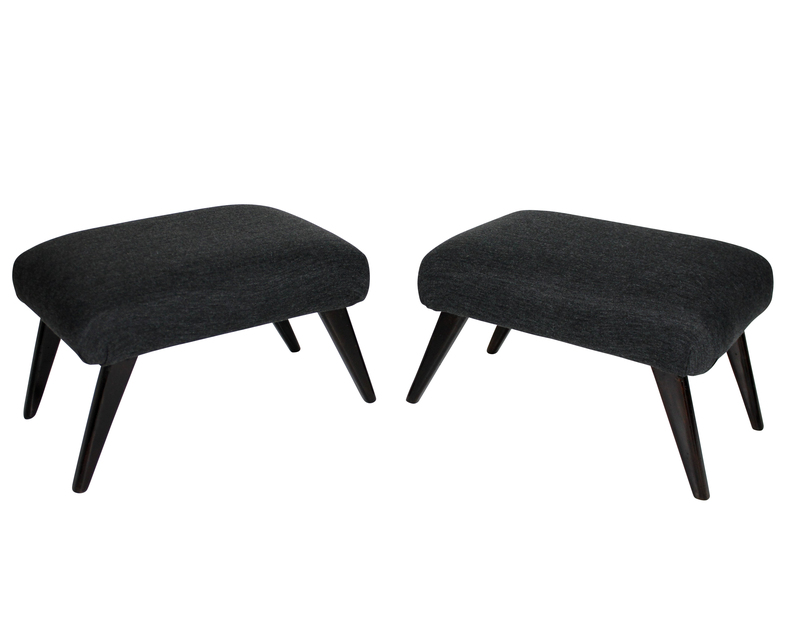 . .
A pair of foot stools by Paolo Buffa. En suite with a pair of club chairs and settee. . .
A Pair of elegant club chairs by Paolo Buffa. In two tone coloured wood with the original recovered sprung seats and cushions. . .
En suite with a settee and pair of foot stools. . .